Foram Maheshwari and Ankita Parmar. "A Review Study on Gas-Solid Cyclone Separator using Lapple Model." Journal 4 Research 4.1 (2018): 1-5. Lakshmipriya N and Nitheesh V B. "An Integrated Approach to Reduce Intra City Traffic at Coimbatore." Journal 4 Research 4.1 (2018): 6-11. T.Vivekananthan, Mr. Sathis Kumar .T M.E, N.Vijay Kumar, R.R.Vinodh and U.VinothKumar. "Chatbot for College Related Queries." Journal 4 Research 4.1 (2018): 12-16. Shraddha Omprakash Koche and Prof. Abhijit G. Kalbande. "Line Follower Robot." Journal 4 Research 4.1 (2018): 17-20. Mr. S. Ashwin, Mr. A. C Sountharraj and Mr. M. Arun Gokul. "An Overview: DakNet Technology - Broadband Ad-hoc Connectivity." Journal 4 Research 4.1 (2018): 21-24. Patel Hariketan Bipinkumar, Patel Mayurkumar Ravjibhai and Tandel Dakshkumar Ratilal. "Design Analysis and Fabrication of Manual Rice Transplanting Machine." Journal 4 Research 4.1 (2018): 25-29. Sachin Gupta, Dhirendra Kumar, Arup Bandyopadhyay and S. L. Gupta. "Laboratory Study of Strong, Moderate and Weak Sandstones." Journal 4 Research 4.1 (2018): 30-37. Mr. Rahul R. Patil, Mr. Nikhil P. Ambole, Mr. Sandesh S. Awati, Mr. Altaf S. Shaikh and Prof. C. G. Harge. "A Review on Lifting and Assembly of Rotary Kiln Tyre with Shell by Flexible Gripper." 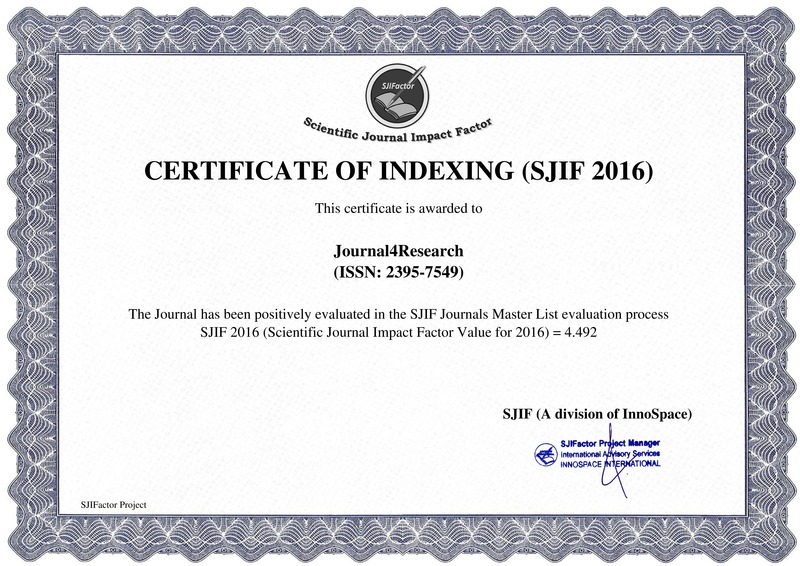 Journal 4 Research 4.1 (2018): 38-40. Shradhesh Rajuji Marve, Shreyas R. Shende, Sana F. Pathan, Amar G. Jumnake and Chandrakant S. Bhashakhetre. "A Review on Design of Public Transportation System in Chandrapur City." Journal 4 Research 4.1 (2018): 41-47. B. Vengataramanan, K. S. Chandrasekaran, A. Varun Ignatius, R. Vasanthaguru and B. Vishnu Shankar. "HCI Based Application for Playing Computer Games." Journal 4 Research 4.1 (2018): 48-52.